Ann McElhinney is director and producer of Not Evil Just Wrong, a feature documentary that looks at extreme environmentalism, and Mine Your Own Business, the first documentary that asks difficult questions of the environmental movement. McElhinney has received two death threats from environmentalists because of the content of the documentary, but positive press from the left-wing UK Guardian newspaper and Newsweek. 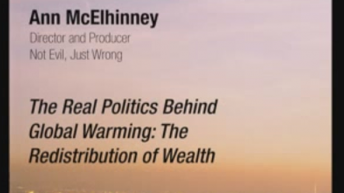 McElhinney has filmed documentaries for the BBC, CBC, and RTE, the Irish state broadcaster. She has worked in Canada, Romania, Indonesia.